Bookride: Salman Rushdie. Midnight's Children, 1981. 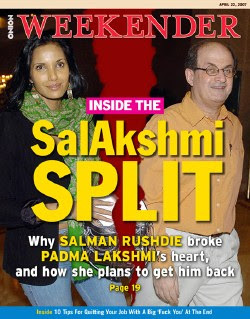 Salman Rushdie. MIDNIGHT'S CHILDREN. Jonathan Cape, London, 1981. Winner of the Booker Prize in 1981 and awarded "The Booker of Bookers" in 1993 for the best Booker Prize winning novel in the first twenty five years of the award. The work is regarded by many critics and readers as the great classic of the late twentieth century. Another critic (Jonathan Bate) quoted in a previous entry on Marquez's One Hundred Years of Solitude wrote: 'Let us hope that [it] will not generate one hundred years of overwritten, overlong, overrated novels. Enough that it has already inspired such excrescences as Angela Carter's Nights at the Circus and Salman Rushdie's Midnight's Children.' With a discernible backlash against magic realism, with which Rushdie is forever associated, the book is no longer rated as highly as it was - except by earnest book dealers trying to shift it. As a great story teller he will always be collected and many people who were underwhelmed by Midnight's Children were delighted by 'Haroun'--but as a prose stylist he is not seen to be in the class of Nabokov or Borges, and falls a long way short of his ingenious contemporary Martin Amis. It is not the most difficult Booker to find, that honour belongs to Middleton's 'Holiday'. However it is possibly the most valuable - a fine copy in jacket (the spine of which tends to fade) can command over £1000 especially if signed. There are some dealers charging considerably more than this for copies signed with pre Fatwa signatures--one asking a 'dream on' £5K says of his: '...the signature is nothing like the (understandable) scrawl you get today, but strikingly full, long and beautiful and really different from anything we have seen over the years.' It is true that signed Rushdie books in this century are very common and the signature is hasty, if not perfunctory. The king of the 'get lost' signature is old rocker Lou Reed--on some of his books it looks pretty much like two straight lines and would shame a GP -it goes something like this '___ ____'. They are still quite saleable, mainly because he is unapproachable and unpleasant and perhaps because he is one of the supreme songwriters. VALUE? The highest record for any Rushdie book is the £1800 paid in 2001 for a limited edition 'Satanic Verses- --one of 12 copies , signed and bound in full morocco leather. This is a book that will rise ineluctably, mostly because of the furore around the book. An interesting inscribed copy of 'Midnight's Children' surfaced in 2003 and made £1000. The cataloguer notes that Rushdie had worked as a freelance copywriter for the advertising agency Charles Barker; one of the accounts that he handled was that of the financial service group M&G, in the course of which he got to know a Roger Jennings who was working for the company. 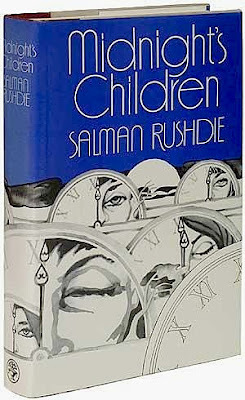 Rushdie would often discuss Midnight's Children (which he was then writing) with Jennings, and promised him an inscribed copy, once it was published. The highest auction record for 'Midnight's Children' is £1100 inc premium paid in 2004 for a (presumably fine/fine) copy signed by the author on the title page. This year at Bonham's L.A. a signed copy in near fine jacket made $1440. In the short term the prices of his books have been falling off slightly or , at best, they seem to be bumping along with a lot of auction lots being 'bought in' - indicating over-enthusiastic sellers and apathetic, indifferent buyers. However it is likely that this and his more difficult books will rise in value. Possibly something to do with India becoming richer, his large and enthusiastic 'chattering class' fanbase and the great fame and notoriety (see left) of Salman himself and finally the difficult of finding limpid copies. SEE COMMENTS BELOW - palpable signs of a bull market in the book. It is possible that he will get a Nobel prize to add to his knighthood. Nobel Prizes, like movies, are always supposed to turbo-charge prices but it seldom happens. When the great playwright, poet and politico Harold Pinter won the Nobel we sold a few signed editions that had been kicking around for years - but so far it has done little for Doris Lessing values. Outlook? Good, if you can wait. I like to buy my favorite various rare books at very reasonable price from AbeBooks store....! Someone paid $7,000 on AbeBooks for a copy of Rushdie's "Two Stories," limited to 12 copies. See AbeBooks blog. PS: I've finally linked to your blog. Sorry for the delay. Scarce signed. At the time Rushdie was writing this novel he was very active in combating racism, particularly racially motivated violence against Bangladeshis and Afro-Caribbeans in North London. He was a member of the management committee of ‘Camden Committee for Community Relations’, and this book is inscribed to a staff member of the CCCR, one Narendra Makanji. Narendra Makanji was elected a local councillor and served as such for the next twenty-four years. During this time he was the Chair of the Labour Party Black Section, which led the campaign for the election of Black MPs to the British House of Commons. In 1987, four Black MPs were elected providing Black representation for the first time since 1927. The date of the signature is significant ; at the time the author was not famous and the date (16th of September 1981) is some weeks before the Booker Prize for 1981 was announced. The lot also includes the CCCR’s Annual Report for 1981. Sold for £1600. 13 March 2008. In addition to the Bloomsbury copy, several copies of Midnight's Children have sold at GBP 2000+ (including one at over GBP 3500). The highest priced copies on ABE have been selling regularly. Also, the edition of XII of the Satanic Verses has appreciated considerably in value from the prices you mention (GBP 3700+). Also, I know of at least two copies of the limted edition of Two Stories selling above GBP 3500 and one currently listed on ABE for GBP 5000). "Rushdie would often discuss Midnight's Children (which he was then writing) with Jennings, and promised him an inscribed copy, once it was published. The copy was inscribed in 1981 somewhat belying this note." It does not belie his promise at all. Midnight's Children was published in 1981 (as is correctly stated under the image of the book on your blog and in your mention of its winning the 1981 Booker), not 1977 as you mention in the title.